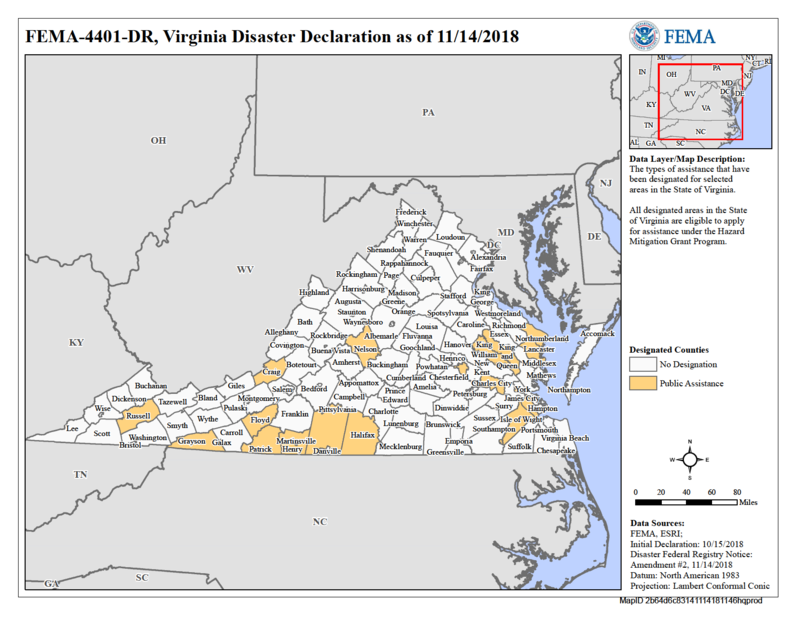 The Federal Emergency Management Agency (FEMA) hereby gives notice to the public of its intent to reimburse eligible applicants for eligible costs to repair and/or replace facilities damaged by Hurricane Florence (FEMA-4401-DR-VA) occurring from September 08, 2018- September 21, 2018. This notice applies to the Public Assistance (PA) and Hazard Mitigation Grant (HMGP) programs, implemented under the authority of the Robert T. Stafford Disaster Relief and Emergency Assistance Act, 42 U.S.C. §§ 5121-5206. Under a major disaster declaration (FEMA-4401-DR-VA) signed by the President on 10/15/2018. The following counties are eligible for PA only: Charles City, Franklin, Halifax, Henry, King William, King and Queen, Lancaster, Nelson, Newport News, Northumberland, Patrick, Pittsylvania, Richmond, Russell, Williamsburg. On November 14, 2018 Craig, Floyd, Grayson, and Isle of Wight were added. On November 15, 2018 Botetourt, Chesterfield, Franklin, Lunenburg, Mathews, Mecklenburg, Nottoway, Pulaski, and Roanoke and the independent cities of Bristol, Danville, and Martinsville were added. Additional counties may be designated at a later date. All counties in the Commonwealth/State of Virginia are eligible for Hazard Mitigation Grant Programs (HMGP). As noted, this may be the only public notice regarding the above-described actions under the PA and HMGP programs. Interested persons may obtain information about these actions or a specific project by writing to the Federal Emergency Management Agency, Joint Field Office, 4461 Cox Rd. Glen Allen, VA Comments should be (addressed) sent in writing to Donald Keldsen, Federal Coordinating Officer, at the above address within 15 days of the date of this notice.